Over the past few weeks I’ve been reading about a great initiative of Jean Hailes for Women’s Health called Women’s Health Week. So this week there are plenty of activities including cycling related events, to encourage women to focus on their health, both physical and mental. Most women are not good at focusing on themselves and making their health a priority, so put a few hours aside this week to do just that. And there’s no better way to undertake physical activity than cycling. And note that I used the term physical health rather than sport. Sport always makes us non-sporty types turn off. Physical activity or exercise if you will, is not just about competition, it’s about moving your physical and mental self. It is known that cycling aids us in enhancing our mood. Our body releases Serotonin or the happy hormones and endorphins in response to the neurotransmitters or the brain chemicals while we exercise. These endorphins trigger a positive feeling in the body that is similar to that of morphine. Endorphins also act as a sedative and aid in diminishing the pain perception. 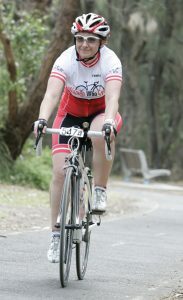 Cycling is one of the best exercises known to release happy hormone. Yet another mental health benefit of cycling is it helps in relieving anxiety and stress. Our stress hormone or cortisol gets reduced while cycling or exercising. Apart from this, BDNF or Brain Derived Neurotrophic Factor is released when we exercise that helps in protecting our brain from stress. This helps in generating happiness and improving memory too. Cycling also helps in improving self confidence. The serotonin mood neurotransmitter released while cycling aids in keeping us stable, socially and emotionally. It helps in enhancing positive feelings, self esteem and self confidence. Apart from this, cycling gets you in shape physically and it helps you in improving your confidence too. Usually exercise helps in improving good sleep. HGH or Human growth hormone is released by the brain in to our blood stream while we sleep. This HGH is a part of the repair and restoration function of sleep in people whose working hours, or any other factors make it hard for them to have a normal sleep. It is found that sleep and exercises like cycling can induce the release of HGH; this in turn would help in having a proper sleep. Dopamine is an important feel-good neurotransmitter which is essential for us as it keeps us feeling energised and motivated. Cycling or endurance training can improve the activity of dopamine receptors in the brain and this in turn will keep us energised and motivated. One of the best benefits from cycling is that it helps in preventing or reducing depression. Cycling can be effective as psychotherapy or antidepressants for depression. However the exact mechanism is not yet clear. Cycling releases Dopamine and Serotinine hormone which may be playing a crucial part in the process. Doing 20 to 30 minutes of cycling everyday can be beneficial for people with depression. So what are you doing to celebrate Women’s Health Week? Share in comments or via the Women Who Cycle Facebook page. This post is focusing out on a women’s health week. Most women in the world don’t take care about their health both physically & mentally. So declaring health week we have to aware about these two health components. Here Admin also has presented some tips to overcome the health condition.